London Underground does not consider the needs of equalities groups when calculating its station staffing levels. LU's methods for collecting information, categorising passenger journeys and assessing data are deeply flawed and fail to account for equality issues. LU did not carry out an adequate Equality Impact Assessment before going ahead with the OSP, despite being obliged by law to do so. The revisions it has made to the EqIA since then are minor and wholly inadequate. The following resolution submitted by East Ham branch was carried at the Regional Council meeting on May 26th. This Regional Council already has policy that RMT should name a figure that the union aspires to achieve for this year’s pay award. We now resolve that this figure should be 6.5% (ie. February RPI+1%) or £2,500 whichever is higher. We feel that this would give greater benefit to the low paid grades whilst still being reasonable for the higher paid Grades. As a public body, London Underground has to carry out an assessment of the impact of any new policy on various equality issues. The attached file is LU's Equality Impact Assessment (EQIA) for its current OSP (policy of cutting 800 mainly-stations jobs). Below is the response to this document that I have written on behalf of RMT. You will see from this that LU's EQIA falls woefully short, and ignores key equality issues. In April, RMT's London Transport Regional Council wrote to disabled people's organisations as part of our 'SOS: Staff Our Stations' campaign, alerting them to London Underground's planned job cuts and the difficulties that these will cause to disabled passengers. You can read our letter here. Several organisations representing disabled people have now sent the following letter to Mayor Boris Johnson, opposing the job cuts. 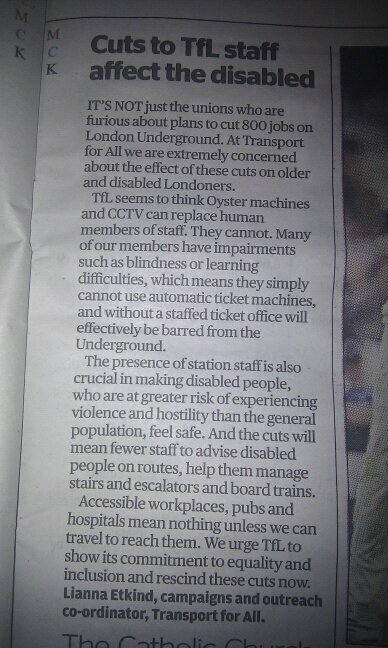 Letter to disabled people's organisations: Staff Our Stations! I am writing on behalf of the RMT trade union to alert you to London Underground’s plan to cut 800 station staff posts and to severely reduce its ticket office opening hours. I believe that this move will seriously reduce the service that London Underground offers its passengers, and will have a particularly adverse effect on disabled passengers. Read more about Letter to disabled people's organisations: Staff Our Stations! 1 This is the second in a series of five brief guides to discrimination in employment. They are intended as introductory handouts for trade union representatives and people in the workplace. Their aim is to set out the main provisions which protect and enhance the equal treatment of men and women at work. Since discrimination law has become increasingly complex, the particular circumstances of a case may have a significant impact on the prospects of success and these Guides are not a substitute for legal advice except in the clearest of cases. Like most reps and activists in the union I have not had to deal with the Disability and Discrimination Act (DDA) in any great detail. I am aware of the headline issues: the DDA exists; it is a bad thing if an employer discriminates against someone who is disabled; and an employer must carry out a thing called "reasonable adjustments" for existing staff and potential recruits. But that was the extent of my knowledge.